This recipe is from my friend Carrie Birrer, who used to own Florio Bakery in Portland. The combination of garlicky greens and white beans is delicious; just don't let it sit around too long on the stove after making it, as the greens will turn to sludge. My rendition of this recipe calls for fewer anchovies and a pinch of red pepper flakes; adjust both according to your own taste. In a small stockpot or medium saucepan, blanch the chard in 2 cups of lightly salted, simmering water until the color is set. Drain the chard, reserving any liquid that remains. Coarsely chop the chard. Very finely chop the anchovies together with the rosemary. In a small saucepan or skillet, cook the garlic cloves in the olive oil over low heat, stirring often, for about 5 minutes, until the garlic is pale gold. Discard garlic and pour the garlic-infused oil into a soup pot. Heat the oil over medium heat; stir in the anchovies, rosemary, and red pepper flakes. Add the chard and cook until tender, stirring to coat the leaves thoroughly with oil. Add the beans and cook until heated through. Add up to 2 cups of reserved chard water and bean broth (the liquid from cooking the beans) as well as the chicken broth. Bring to a boil, then add the dried pasta and cook until the pasta is tender. Season to taste with salt and black pepper. 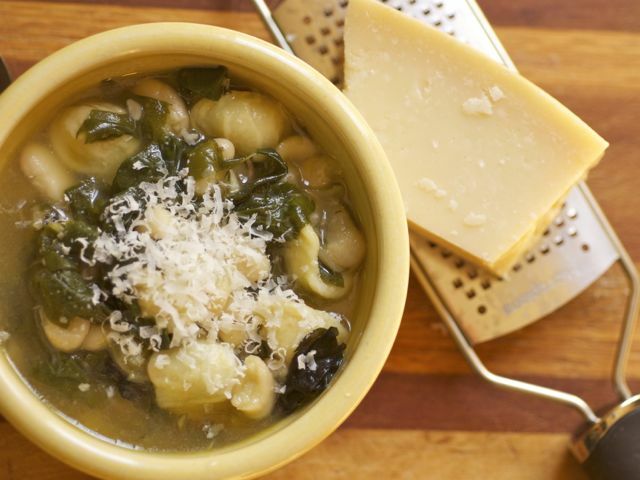 To serve, divide the soup among bowls and garnish with grated Parmesan cheese. If using canned white beans, rinse them thoroughly before adding them to the soup. In place of the bean broth, use a little extra water when blanching the chard to make sure you have 2 cups of reserved chard water.